On a very pleasant sunny Sunday afternoon at Engadine on 16th Januay last Margaret and Allan were delighted to be able to offer wonderful entertainment in the form of a very talented duo namely The Draiocht. June McCormack on wooden Irish flute and Michael Roooney on harp are touring Australia at the moment and we were lucky enough to have them entertain our increasingly enthusiastic audience. Their only Sydney gig, there is something special listening to a concert in a personal, intimate atmosphere of a home. Audience involvement is so spontaneous. Everyone sang along heartily to Sally Gardens. They even delighted us with Danny Boy; as Michael says it's a tune he doesn't often perform, but being special circumstances he knew it would be appreciated. At afternon tea, Allan's warm buttered spinach bread disappeared before I could get a slice! Plenty of time to socialise around a cuppa and goodies. 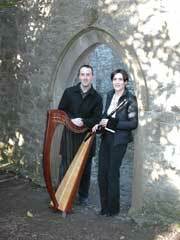 Such an unpretencious but highly skilled, cheerful young couple, The Draiocht set the audience into a relaxed state. Some of their stories behind the songs were equally as entertaining. House Concerts do require a certain amount of phoning around a month before and catering but it's all worth it when you hear the appreciative comments at the end and see the looks on listener's faces as they take in the music. We can cater for between 30 and 40 people in our spacious upstairs room overlooking the National Park.